SIHH 2019: Piaget Polo S Green Blueish Dial Limited Edition. Live Pictures & Pricing. Endowed with a 42 mm stainless steel case the Piaget Polo S on strap sports a limited edition new dial that is die for. Despite that since the time of its launch we haven’t been the biggest fans of the Piaget Polo S because of its design lacking much originality and looking more like a crossbreed between a Patek Philippe Nautilus, an Aquanaut and the original Piaget Polo, when it comes to this particular new Polo S Green Limited Edition, our stance is completely different. After seeing the watch in the metal sporting this new dial at the SIHH 2019, we have to say that this Piaget Polo S is extremely good looking and one that we would consider wearing without any hesitation. Posted on January 20, 2019 by Editor & Publisher and filed under Piaget, SIHH 2019, SIHH and tagged Piaget Polo S Green Blueish Dial Limited Edition Piaget Mainstream Brands Time Date Watches Limited Edition Watches 2019 SIHH SIHh 2019 Most Popular. SIHH 2018: Piaget Altiplano Ultimate Automatic 910P. The World's Thinnest Automatic Watch. 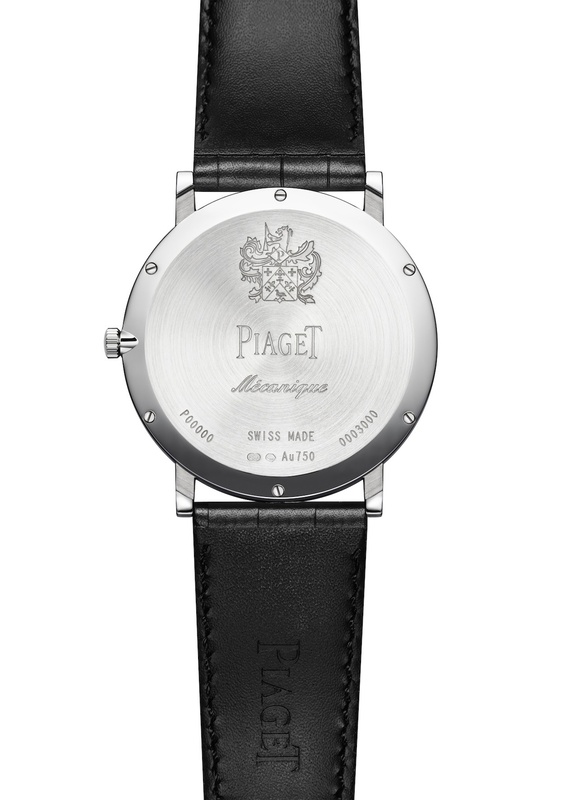 It is very well known by watch collectors and watch scholars that when it comes to ultra-thin watches, Piaget is an authority. Defying the limits of feasibility, Piaget released three new watches —one as a concept— that continue to demonstrate their ability to succeed in the field of ultra-thin timepieces. Three years after the launch of the slimmest manual-winding watch in the world at that time, the Piaget Altiplano 900P, Piaget is once again wowing everyone, this time with the new Altiplano Ultimate Automatic 910P. Posted on January 25, 2018 by Editor & Publisher and filed under Piaget, SIHH 2018, SIHH and tagged Piaget Altiplano Ultimate Automatic 910P Piaget Altiplano Piaget SIHH 2018 Mainstream Brands SIHH. News: Pre-SIHH 2018 Piaget Altiplano Ultimate Automatic 910P. The World's Thinnest Automatic Watch with Peripheral Rotor. Defying the limits of feasibility, Piaget provides a new demonstration of its supremacy in the field of ultra-thin watchmaking, stemming from the excellence of its two integrated Manufactures. Three years after the launch of the revolutionary slimmest manual-winding watch in the world at that time, Piaget is once again defying the laws of horology by presenting the new Altiplano Ultimate Automatic watch with a mere thickness of 4.30 mm. To celebrate the 60th anniversary of the Piaget Altiplano, Piaget has now added to their lineup what is now the world’s slimmest automatic watch. Posted on December 18, 2017 by Editor & Publisher and filed under News, Piaget, SIHH 2018, SIHH and tagged Piaget Altiplano Ultimate Automatic 910P Piaget Altiplano Piaget SIHH 2018 2017 Mainstream Brands. Insider: Presenting the New Piaget Polo S Chronograph. Hands-on with an In-House Chronograph Under $13,000 USD. Yesterday, we brought you our hands-on review of the new Piaget Polo S here; today, we bring you our hands-on review of the other two watches unveiled last Thursday July 14th, 2016 at the Piaget event in New York City as we recapped it here. The new Piaget Polo S Chronograph is perhaps the best option when it comes to this new watch collection. Posted on July 19, 2016 by Editor & Publisher and filed under Piaget, Other Brands and tagged Piaget Polo S Chronograph Piaget Polo S Piaget Most Popular. Insider: Presenting the New Piaget Polo S. Hands-on Review & Live Pictures of the Entry-Level Piaget Priced Under $10,000 USD. Last Friday, we brought you our recap of the launch party for the new Piaget Polo S with some preliminary images of the watch in the metal. Today, we are bringing you our hands-on review and our objective thoughts on what is already a somewhat controversial watch design, referred to by many as a 'Nautilus Copycat'. While the new Piaget Polo S uses a very strong selling tagline that reads: "Play a Different Game"; it is very hard for us to see such thing anywhere in the design or the name of this new watch. Posted on July 18, 2016 by Editor & Publisher and filed under Piaget, Other Brands and tagged Piaget Piaget Polo S Most Popular. Just like other watchlifestylers, we love to run into fascinating timepieces every once in a while. This time we came across an ultra rare Piaget 50th Anniversary ultra-thin squared-shaped Altiplano fob watch in rose gold. But what makes this example even more desirable or rare, is the fact that this is number one out of only twenty-five pieces ever made. Even though it is not the most popular model, for those that appreciate Piaget timepieces, it is definitely a must have in their collection. Posted on July 14, 2016 by Editor & Publisher and filed under Other Brands, Piaget and tagged Piaget 50th Anniversary Altiplano Square-Shaped Fob Watch Piaget Ultra-Thin 50th Anniversary Pocket Watch Piaget Pocket Watch Limited Edition 25 Pieces Piaget Calibre 9P Posts 2013 Most Popular. SIHH 2016: Presenting the New Piaget Emperador Coussin XL 700P. Hands-on Live Pictures & Pricing. Perhaps one of the most intriguing and exciting launches this year at the SIHH 2016, was the unveiling of the new Piaget Emperador Coussin XL 700P. This new watch is truly the first hybrid timepiece with a mechanical and quartz beating heart. To celebrate the 40th anniversary of its first in-house quartz movement —the famous ultra-thin 7P calibre presented in 1976— Piaget unveiled the Emperador Coussin XL 700P at the Salon International de la Haute Horlogerie in Geneva. Posted on January 25, 2016 by Editor & Publisher and filed under SIHH, SIHH 2016, Other Brands, Piaget and tagged Piaget Emperador Coussin XL 700P Piaget SIHH SIHH 2016 Most Popular. To celebrate the 40th anniversary of its first in-house quartz movement, the famous ultra-thin 7P calibre presented in 1976, Piaget unveils the Emperador Coussin XL 700P. This new watch is an astonishing concept watch issued in a 118-piece limited edition. News: Pre SIHH 2014 Piaget Presents the Altiplano 38mm 900P. The World's Thinnest Mechanical Watch Merging Calibre and Case. Neither entirely a movement nor exactly a case – or rather both at once: introducing the Altiplano 38mm 900P, the world’s thinnest mechanical watch. Merging the hand-wound calibre with the case elements, it is designed as a single entity in order to achieve record-breaking slenderness at just 3.65 mm thin. Representing a crowning achievement in over half a century of virtuoso skills displayed in the realm of ultra-thin watchmaking where Piaget reigns supreme, it conveys the excellence of the two integrated Manufactures run by the Maison. Places where the skills of the watchmakers, case constructors and designers converge in giving life to this masterpiece of reliability and precision. 2014 is a vintage year for Piaget! The Maison is celebrating its 140th anniversary and marks the occasion by launching a model that is set to defy the conventions of ultra-thin Fine Watchmaking for many years to come: the Altiplano 38 mm 900P. While clearly geared towards cutting-edge innovation, it is also a nod to history, since it gets the 900P part of its name from Calibre 9P, which was the first ultra-thin hand-wound movement made by Piaget in 1957. That particular mechanism measured just 2 mm thin and sealed Piaget’s destiny in the field of ultra-thin horology. By 1960, Piaget was ready to set a first record with its Calibre 12P, the world’s thinnest automatic movement at just 2.3 mm. The following years witnessed a spate of new slimness records in the fields of hand-wound and automatic models, with or without horological complications – like Calibre 600P, the world’s thinnest hand-wound shaped tourbillon movement; and 1208P, an automatic movement that was also the thinnest in its category, to mention just a couple of these feats. Constantly reaffirming its unconditional love of slim mechanisms, the Manufacture de Haute Horlogerie Piaget has produced no less than 23 ultra-thin calibres out of the 35 movements developed and produced in-house, of which 12 have set new records for thinness over the past few years and are now part of the collection. While the Altiplano 38 mm 900P merges the case and movement to establish itself as the thinnest mechanical watch ever, it also stems from another fusion without which such a feat would have been impossible: that of the two Manufactures Piaget – one based in La Côte aux Fées, where the movements are traditionally made; and the other in Plan-les-Ouates, where the cases are crafted. These skills are now inextricably intermingled, since within the Altiplano 38mm 900P, the mechanism and the external components form a single indivisible entity. For a full three years, watchmakers, case constructors and designers worked together at each stage of development, production, adjustment and finishing in order to give life to this slender marvel. Each technical choice had an aesthetic impact, and vice versa. While each of the 145 parts composing the Altiplano 38 mm 900P has been trimmed to a size sometimes barely thicker than a hair’s breadth –including some wheels measuring a mere 0.12 mm thin compared with 0.20 mm on a classic movement– special care has been devoted to clearances. In other words, the process involved cleverly arranging the components to within the nearest hundredth of a millimetre so as to create optimal play between the fixed and mobile organs, while being careful to ensure that the later move freely and thus guarantee the smooth running of the mechanism. Nonetheless, the true secret of this extreme slenderness lies in the structure of the case itself, of which the back also serves as the mainplate. Thereby merging calibre and case, the latter was machined directly from the case back in order to house the mechanical parts. This highly complex architecture meant reversing movement construction so as to fit the bridges on the dial side —an approach that also has an aesthetic effect by keeping them visible. To save another precious few millimetres, the entire mechanism and the hand-fitting system are contained within the thickness of the balance-wheel itself, thus entailing an off-centered display of the hours and minutes entirely in tune with the iconic design features of the Altiplano line. These characteristics are further enhanced by the entirely visible wheeltrain that invites the owner of the watch to plunge into the very heart of this supremely slender and technically sophisticated mechanism. Working within this extremely confined space, Piaget has devised a suspended barrel hanging from a single bridge on the dial side, contrary to classic barrels that are also fixed to the mainplate side. This highly unusual device is no way detrimental to the performance of the mechanism, since the Altiplano 38 mm 900P has a generous power reserve of around 48 hours. intricacies at the heart of the Altiplano 38 mm 900P, the bevelled and satin-brushed sunburst bridges are black-coated to create elegant contrasts with the white gold case. The index-assembly bearing the Piaget “P” strikes a resounding signature note within this subtly orchestrated Fine Watchmaking symphony. Case Diameter: 38 mm. 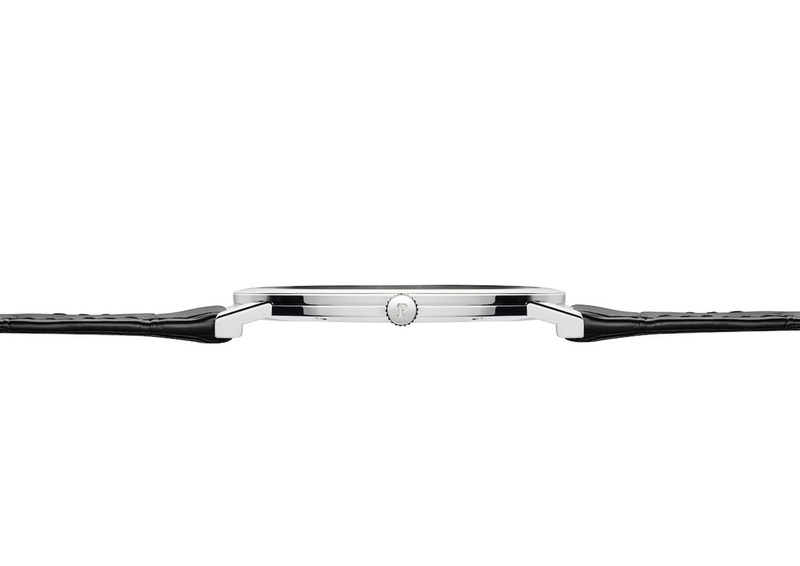 Thinnest ever mechanical in 18K white gold. Posted on December 12, 2013 by Editor & Publisher and filed under News, SIHH, Piaget and tagged Piaget Altiplano 38mm 900P World's Thinnest Mechanical Watch.